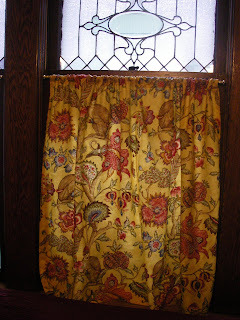 Today I'm making monkey curtains for our dining room. I have finished one of them already-- see above. I'm not sure if I really love this fabric or not, but it (1) matches our dining room walls and (2) was super-cheap ($3!) at an interior decorator's garage sale that I hit this summer. It has monkeys on it, so I can't REALLY go wrong. It's better than staring at the house next door, anyway.